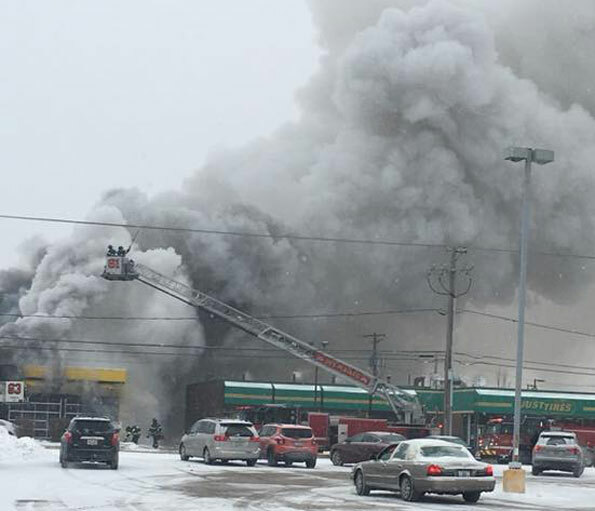 Des Plaines police and firefighter/paramedics responded about 1:26 PM Friday December 29, 2017 to a report of a fire at Car-X, 1108 East Oakton Street Des Plaines, Il. Police and firefighter/paramedics received a report of a fire at Car-X. Engine 62’s crew on arrival reported a working fire at Car-X by 1:27 p.m.
Engine 61’s crew led out with a second 2 1/2-inch line at about 1:31 p.m.
Car-X Fire in Des Plaines at Oakton St near Mannheim Rd.